NCAA Nebraska Cornhuskers "Anthem" Window Curtain Panels - Set of 2 - 36" x 48"
Hang up your official Collegiate "Anthem" Window Panels by The Northwest Company to display your team spirit anywhere in the house! The repeated design of your team's name and logo boldly stand out on the solid background of the panels. No one will question who you're rooting for when they see these panels hanging up! The pair measures approximately 82 inches by 63 inches and are made to fit 36-inch by 48-inch windows. Michigan Wolverines COMBO Shower Curtain, 2 Pc Towel Set & 1 Window Valance/Drape Set (63 inch Drape Length) - Decorate your Bathroom & SAVE ON BUNDLING! LSU Tigers COMBO Shower Curtain, 2 Pc Towel Set & 1 Window Valance/Drape Set (63 inch Drape Length) - Decorate your Bathroom & SAVE ON BUNDLING! 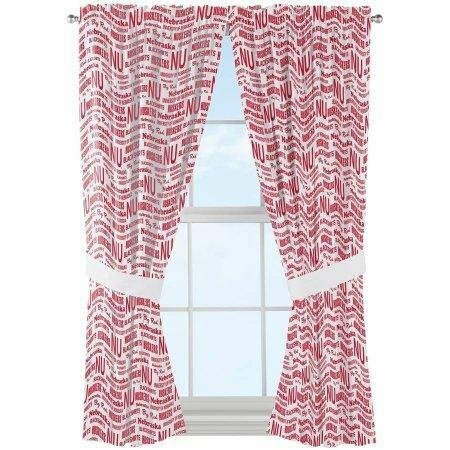 Texas Tech Red Raiders - Set of (2) Printed Curtain Valance/Drape Sets (Drape Length 63") To Decorate Two Windows - Save Big By Bundling! North Carolina Tar Heels - Set of (2) Printed Curtain Valance/Drape Sets (Drape Length 63") To Decorate Two Windows - Save Big By Bundling! NCAA Wyoming Cowboys "Mascot" Window Curtain Panels - Set of 2 - 36" x 48"
NCAA Maryland Terrapins "Mascot" Window Curtain Panels - Set of 2 - 36" x 48"